Last Friday after a lot of anticipation and trepidation (on my part!! 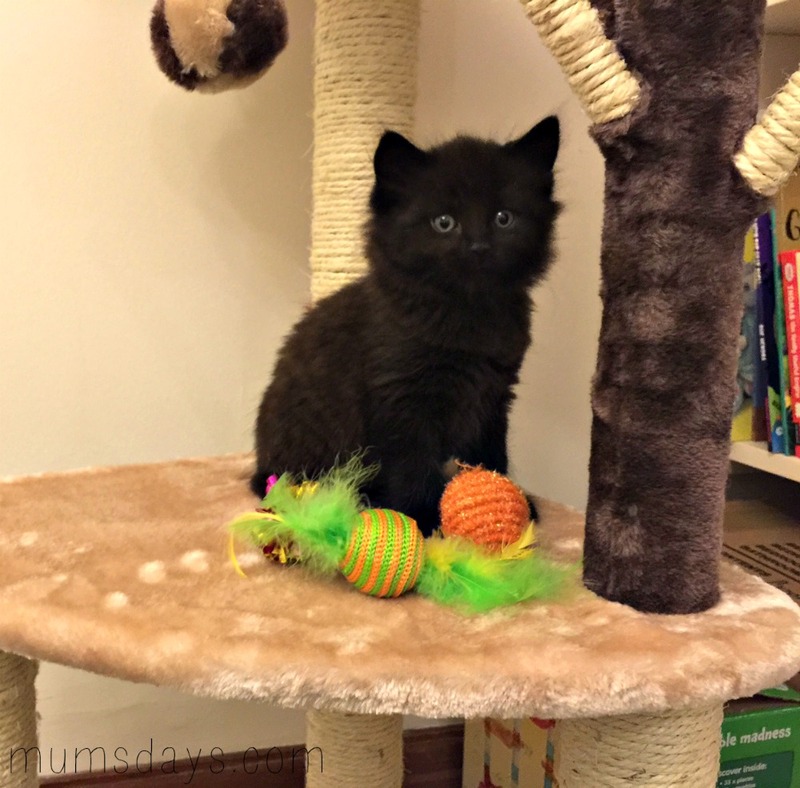 I was starting to think we must be crazy) the kittens, aged 8 weeks old, finally arrived. 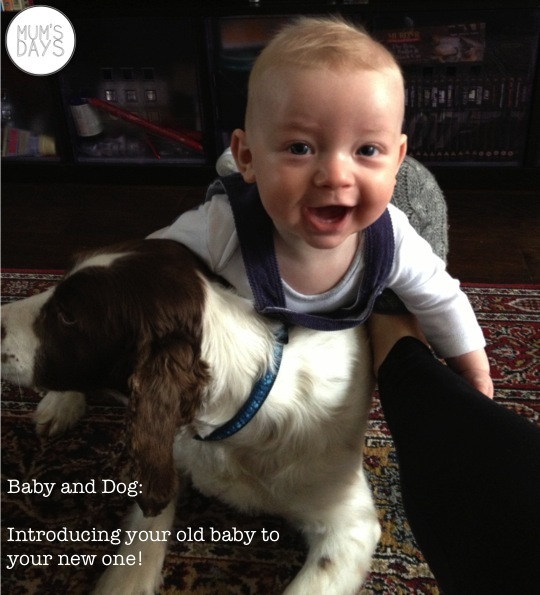 Baby and Dog, Baby and Cat… Introducing your new baby to your old baby! A wee while ago I was chatting to Ally who was 32 weeks pregnant about mum-to-be life …she asked me, and I quote “How do we introduce our slightly nutty cat to the baby when it arrives?” Little Sophie Baker arrived on 7th April, so I’m way too late to help out the Baker family BUUUUT it did get me thinking (albeit slowly): Baby and Dog, Baby and Cat…that’s actually quite a tricky little meeting! We don’t have any pets. I really want a blue (apparently that’s what grey dogs are called) whippet but our downstairs is all hard wood floors, which don’t mix with scratchy little claws. Oh, and I couldn’t handle having a baby and dog, and still manage to look after myself. So I looked to my more ‘with it’ pals (one’s a doctor, one’s a dentist, need I say more?) to tell me how they introduced their pets to their new arrivals. Misty is our 6 year old cat. She’s quite nervous (she hides when we move furniture, vacuum or pack boxes!) and hardly ever goes outside. She tends to avoid being downstairs when we have visitors – only a chosen special few get to have a stroke! She hates any change to her routine and I was a bit nervous about how she’d react to a new baby. 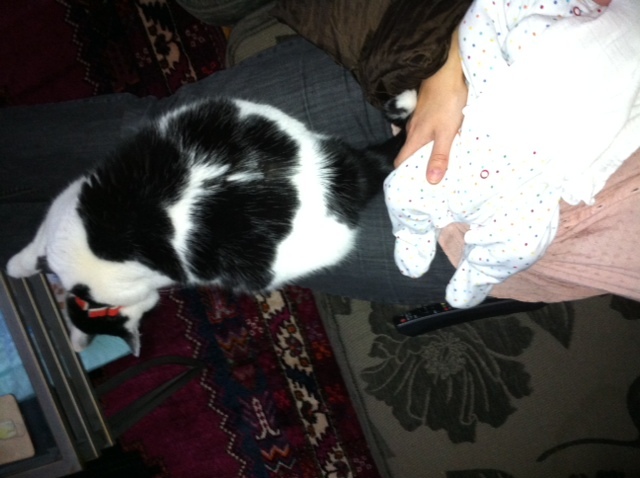 The first couple of weeks after bringing Lewis home she kept out of the way but seemed a bit upset and unsettled. I shut her out of our room at night as I was scared she’d get in the cot with Lewis as he’d be warm and inviting! She hated this as she normally sleeps on the bottom of our bed. After a week or so of her crying outside our door my husband, Laurence, bought a cat net to go over the cot and we used this for a week or two. It was quite annoying as it made it harder to see Lewis and to be honest the cat never showed any interest in getting into the cot. After 2-3 weeks I felt confident that she would be ok around him at night – gradually I’d leave them in the same room together during the day too, even if I was leaving the room briefly. She likes him now. She has a teddy bear that she carries around and puts by the last door we have gone through (it sits by the front door when we go out and outside our bedroom door at night). This morning it was outside Lewis’ room! He’s privileged. If he cries, Misty comes to find us and bites Laurence (gently) as if to say ‘do something!’ She comes into the bathroom to check we do a good job at his bath time and she sits next to us when we feed him at night. She seems to know that she mustn’t go on his things. 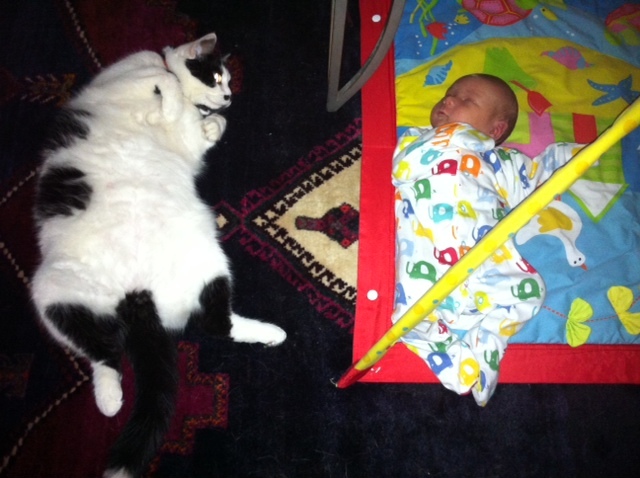 She walks around his blankets and mats and will lie near him but not touching them (see the picture above!) And yes, she’s a curvy cat! Misty and Lewis share a knee! It’s a dogs’ life… I now understand where this saying comes from! Molly was our ‘baby’. We got her when she was 8 weeks old and have nurtured and trained her into the wonderful 5 year old, liver and white English Springer spaniel she is today. Molly has a fantastic temperament and we spent a long time puppy training her. We always came from the perspective that no matter how much we wanted to anthropomorphise her, she was still a dog, an animal and must be treated that way to know where she stood in our ‘pack’. And that was at the bottom! Now, that didn’t mean treated badly, but she would sleep in her own bed, downstairs, we ate first, then her and we made her do a trick to earn her treats. We practised taking food off her to make sure she wouldn’t snap at us and also to reassert our dominance. She got a treat for doing this successfully. If she was naughty, we wouldn’t tell her off as if she was a child, we would growl at her and bear our teeth and this really had an amazing effect as I guess it was a language she could properly understand (thank you Caesar Millan, dog whisperer extraordinaire!). When George was in the belly, James and I talked about the possible effects bringing a baby home would have on Molly. Would she get jealous? In my hormonal mind this was often thought as ‘Would she savage him and rag him around the living room in an envious fit? 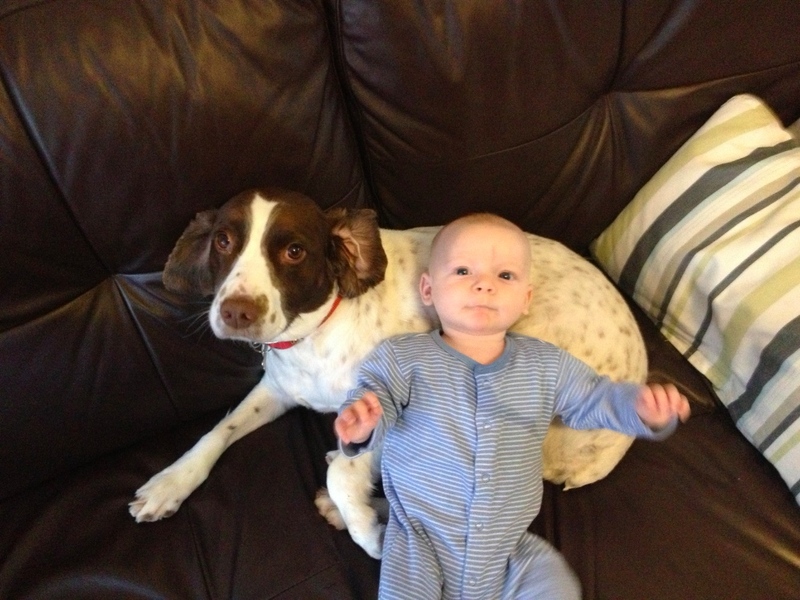 !’ I suppose this is what worries most new parents with dogs, such stories making the media. She wasn’t a dominant dog and had never so much as snarled, but I was still cautious of her reaction to no longer being at the centre of our attention. George was born via emergency section and I was in hospital for a week. This gave us a great opportunity to introduce Molly to our new arrival via smell. 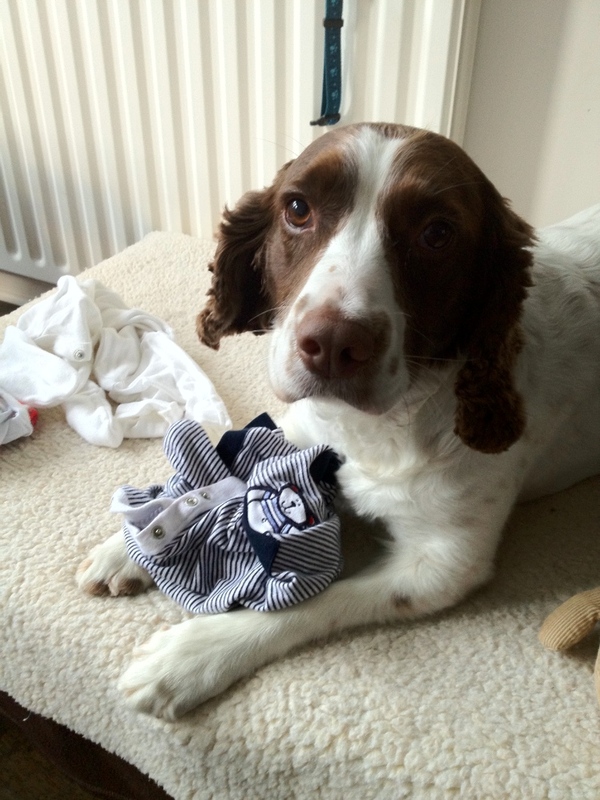 Everyday, James brought home George’s baby grows from hospital and let Molly have them. The result was amazing! She started to carry them around very gently in her mouth, took them to her bed and nestled next to them. She sniffed so hard that she had foam coming from her nostrils! Molly getting prepped – Baby’s best friend! It wasn’t all plain sailing. The change in the home did elicit some behavioural changes. She wouldn’t eat her dinner in the house, not even the garage! We have to feed her outside now. She went through a phase of trying to get in between us and George as if to say “hey ME not HIM!” She went and sat on his play-mat, there was a lot of ‘No’s’ said at this time. Nappies smell like Chanel to dogs. This is not good. Not good at all. 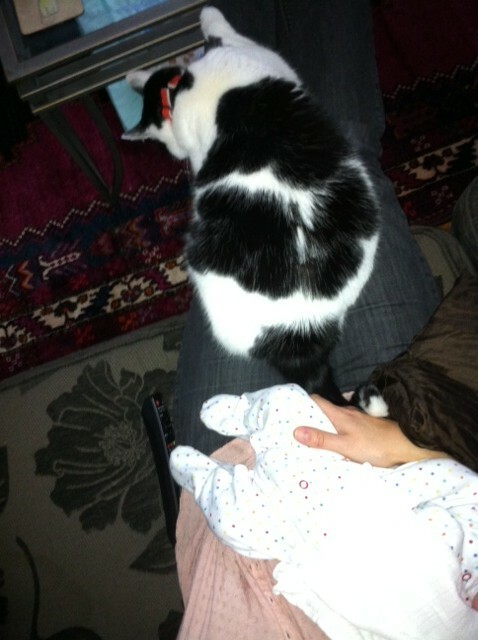 And the pièce de résistance, she wee’d on my father in law while he slept in the spare bed!!! Not her finest moment. She was deposited in the back garden to think about her actions on that one! We are now at 7 months and the ‘teething troubles’ seemed to have subsided. The status quo is returning to our house and Molly has been successfully demoted to bottom of the pack again. Poor love! In fact, as George is progressing and becoming more aware and mobile, a different relationship is forming. Doggy is becoming an interesting target. Big floppy ears are made for pulling. The sighing from the dog is louder than ever. 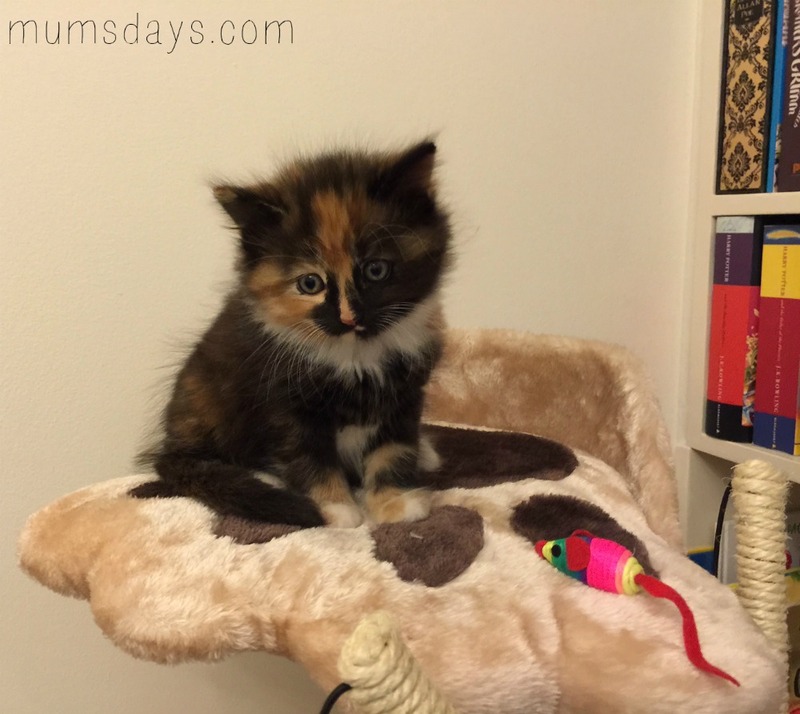 I’m so glad we put the effort in training her previously now and although you can never trust an animal 100%, we enjoy supervised playtime all together. We are teaching George how to try and be gentle and often find the two of them sat side by side, him stroking her (usually immediately before an attempted eye/ear removal by George). I think having an animal in the house can be an amazing learning tool for children… also stroking furry animals has proven stress-relieving properties, so it’s good for the parents! As weaning has begun, you can see a symbiotic relationship forming before your very eyes. The dog patiently lurks beneath the high chair for manna to fall from heaven. Again, we always paid attention to food training with the dog and she never takes food from people without being offered it and having to do a trick. This has given us confidence in giving George a snack around the dog and knowing she won’t try to get it from him. Babies always have food near by, the dog is pretty happy about this. It fuels her for the ‘dog rodeo’ session that is starting to happen on a daily basis (see top picture!). Every day brings changes, and we have to adapt to them including the dog. It has helped us to imagine what it’s like for her with all this change going on and get into her doggy psychology. Hopefully, if there’s a next time, we’ll all be a bit more prepared, but on the whole, I wouldn’t do a great deal differently! I would recommend paying attention to training, especially food training before a baby arrives and also I would get a breed of dog with shorter ears!! Do you have pets? How did they get on with your new bundle of joy? Or are you still pregnant? How are you preparing for the ‘introduction’? !